The first Saturday of the month fell as early as possible in the month of March, the 1st of the month. Early March was still quite wintery for our BirdWalk. Playland Lake was frozen solid with only a small open patch of water. Worse yet, the weather forecast on Friday was for a brittle, cold evening, temperatures around 10 degrees in the city. Colder north. So when I went to bed on Friday evening I anticipated waking to miserable winter morning. But I was wrong. When I walked out the door, the sun was brightly shining. Temperatures were not too bad and there was absolutely no wind. It turned out to be a pleasant day for a bird walk. Unfortunately, the lingering winter kept the early spring migrants farther down south and our winter visitors were hiding. Still our jolly band of 15 birders managed to spot a total of 31 species and actually enjoyed a pleasant morning walk. 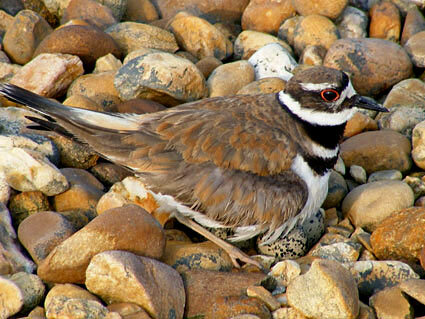 The most unexpected sighting was a pair of early Killdeer that called as they flew past us. Red-winged Blackbirds were early arrival from their wintering grounds. Great Blue Heron, Herring Gull, Ringed-billed Gull, and Great Black-backed Gull.